This is the most famous place in Greece, the Acropolis. You have to climb steps to get to the top but it is not too hard. It was built over 2000 years ago but some of the walls are even older. 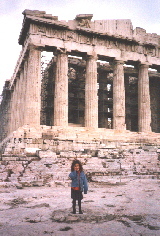 This is me in front of the Parthenon. It is a lot bigger then you think it is going to be once you get up to it. Some people get confused between the Parthenon and the Acropolis. 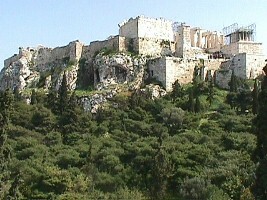 The Acropolis is the mountain and it means the high city. The Parthenon is the building and I don't know what that means. But every year I make my dad take me up there. This is the porch of the maidens or the Caryatids as some people call them. They are holding up the roof on their heads. The real ones are in the museum because the air in Athens was making them fall apart. Many of the statues from the Parthenon are in the museum but some of them are in England. Those are called the Elgin marbles and Greece is trying to get them back but the English say they belong to them now because they bought them from the Turks. Here I am again but this time I am below the Acropolis in the old marketplace called the Agora. The building behind me is called the Thission and it is not as ruined as the Parthenon. This is where the movie For the Love of Benji was filmed. This is where he came when he stole the sausages and shared them with his friend. This is in the Plaka. There are places like this all over and in some places it's like there is an underground city. That's because they built the new city on top of the older cities. 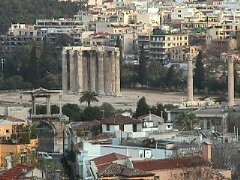 This is the temple of Zeus. It was the biggest one they built. It was so big they couldn't finish it. In front of it you can see Hadrian's arch which used to be the entrance of the city. Now the city goes on forever. 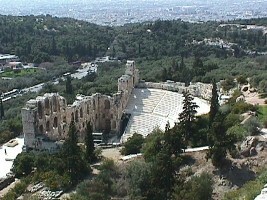 This is the Theater of Herod Atticus, right next to the Acropolis. They still have shows here when the weather is nice. It was built when the Romans were in Greece. 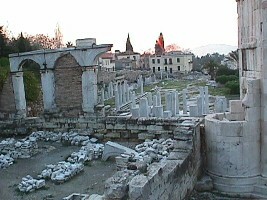 There are lots more ruins in Athens and plenty of museums. There is even a children's museum in the Plaka and also a museum of musical instruments.